These tiny eagles occur in two different colour forms (pale and dark) and are named after their thick feather leggings. They hunt from the air mainly birds up to the size of francolin, but even a few rodents and lizards. They have distinctive white ‘landing light’ markings on their shoulders and when diving after prey their body position becomes heart shaped, with wing tips touching and the leading bend of the wing held apart from the body. They breed on cliff faces, often where a tree grows out of a crack in the rock. 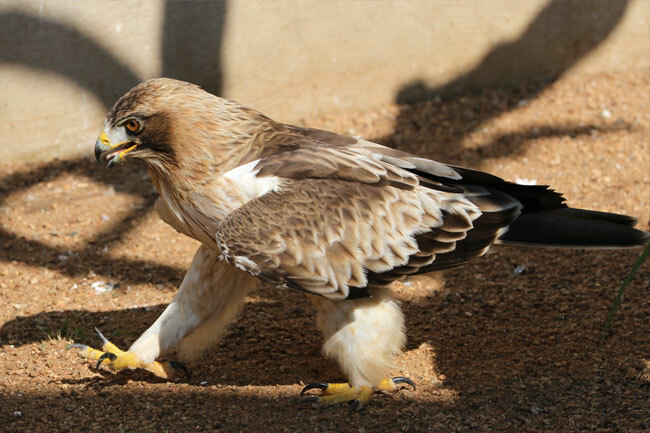 Some booted eagles breed in southern Africa while another population breeds in Eurasia and North Africa and migrate here in summer.